POKHARA, May 17: The delay in vote counting has disappointed the voters who are desperate to see their new representatives assume their offices. The painstakingly slow counting of ballot papers has signaled that the people might have to wait for days to see their new representatives. The excitement was comparatively very high among the locals this time around for the elections which were conducted after a gap of two decades. Before the elections, the voters were counting days to drop their votes and elect capable candidates to shoulder the responsibility of developing their villages. After finally voting for the candidates of their choice on Sunday, the locals thought they won't have to wait for long to congratulate their representatives. But unfortunately they have not been able to do so due to the snail-paced vote counting. There are altogether 33 wards in Pokhara-Lekhnath Metropolitan City, the largest metropolitan city of the country. After the peaceful elections on Sunday, vote counting began from Monday in various local units of the district. By Tuesday evening, vote counting of only two wards (38,000 votes) was completed. According to him, people are losing patience due to the slow counting of votes. “We are compelled to stay for hours under hot sun for a single update. So, it's better if we stay home and watch television,” said Thapa. According to him, the development of communication has made it easier for people to receive information quickly due to which they can't wait for longer. “If it is possible for millions of people to drop votes in a single day why is it taking days to count those votes?” Thapa asked. Though on the first day, a lot of people had gathered around the office of rural municipalities to get the vote counting updates, now they have stopped doing so. Ganga Lal Subedi, election officer of Kaski, accepts that the vote counting has been really slow. 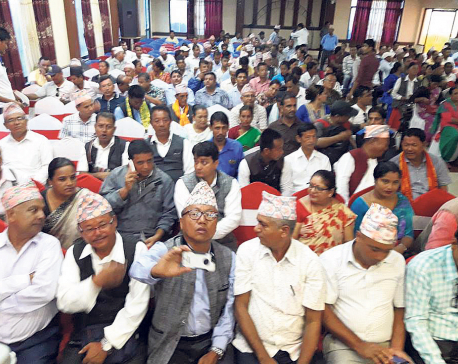 “We have added the number of rooms as well as officers to speed up the work after taking permission from the EC and we are hopeful that might just help,” Subedi said. According to him, the large size of ballot paper and various symbols have made vote counting difficult this time. He further said that it might take five-six more days to complete the counting.